This section provides an early look at GUGLIELMO MARCONI inventions from his first wireless success up to the World War I era. Modern Electrics publisher Hugo Gernsback encouraged the home brewing of many receivers. The 20s saw many hundred's of new Radio Amateurs building basic stations and joining the hobby. Take a look at some of this early ham gear. 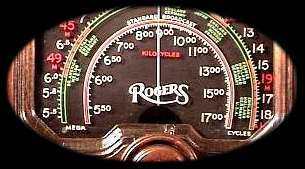 The ROGERS COLLECTION represents the very early years of the Rogers' Telecommunications empire. The Hammond Museum of Radio represents this period in our history with a hundred or so classic high quality receivers. Take a Virtual Tour. The Father of Broadcasting, Reginald Fessenden grew up a few miles north of the Museum in the town of Fergus, Ontario. Take the time to read some of his accomplishments.